NYC Educator: North Korean Strongman Embraces Bloomberg-style "Reform"
North Korean Strongman Embraces Bloomberg-style "Reform"
Mayor Mike Bloomberg, after a midnight New Year's kiss from Lady Gaga, woke yesterday to yet another surprise, an unexpected early-morning call from dynastic tyrant Kim Jong-un. The newly established Supreme Leader was interested in establishing a more positive image in hopes of getting more international aid and better PR. Both Kim and the mayor agreed a good first step would be a new Revolutionary Panel for Re-educational Policy. Kim was delighted to learn he could establish a board to discuss pre-decided matters and have what would appear to be open discussion periods. Bloomberg assured him that most people, including the press, would assume the panel listened to said discussion. Whether or not they actually did was of no importance whatsoever. Were anyone to disrupt said panel, Kim could simply have his reps shake their heads disapprovingly while state-controlled newspapers editorialized about how disrespectful and inconsiderate the protesters were. Kim could appoint 8 members, others could appoint 5, and after all discussion, the board would simply do whatever Kim told it to do. Dissenters among Kim's 8 could be disposed of as he saw fit, and, surprising to Kim, he could get rid of them before any actual voting took place. Kim was shocked to learn that this was how things were done in a democracy, and was confident that adoption of such methods could result in a PR bonanza. Mayor Bloomberg's staff provided numerous NYC editorials as evidence of how effective the practice has actually proven to be. 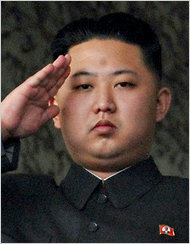 Kim was also effusive in his praise of NYC Schools Chancellor Dennis Walcott and NY State Governor Andrew Cuomo. He expressed great admiration for the way these leaders pretended to negotiate in good faith with organized labor, and then, when they failed to get exactly what they wanted, simply chose to ignore the agreement altogether. Kim, through an interpreter, expressed great optimism that he could run his country the way New York City was run and still appear to be moving toward democracy. "This is a great opportunity to shape an image for myself, rehabilitate my country's image, and still do whatever the hell I feel like," said Kim. "It's like they say, New York New York, if you can pull it off there, you can pull it off anywhere."